← “First Monday, First Person” Salon begins next Monday night! How About Some Human Rights? Calling all writers of “True Stories Well Told” who might want to contribute to what I post on October 16, Blog Action Day. 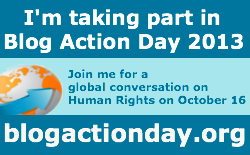 Blog Action Day this year will focus on the topic Human Rights. Send me a line or two by 10/14 about YOUR human rights story and I will blend them into my blog post for Oct 16, or invite you to write a guest post for this blog.